Battles continue unabated between BA’s 88th LID troops and a combined force of KIA’s 9th Battalion and AA’s 105th Battalion troops near Sinli Bum in Kutkai township on Aug 30. KIA sources said about 100 BA troops advanced into Sinli Bum area at around 4:10 pm and the two sides exchanged fire for hours. On the same day, BA troops and TNLA troops fought at Ma Lun Bum, located between Sinli Bum and Nam Um, at around 6:10 pm. 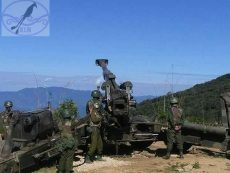 On Aug 29, a combined force of TNLA and MNDAA troops battled BA’s 99th LID troops at Kye Hkang Namba Tek village in Kunlong township at around 3 pm.